"I Haven't Got the Nerve"
The song features a flute solo played during the instrumental bridge of the middle portion of the song. Michael Brown got the idea for the flute solo from The Mamas & the Papas song "California Dreamin'" which had been recorded in November 1965 but wasn't a hit and in heavy rotation until early 1966. The arrangement also includes a lush string orchestration, a memorable harpsichord part, and a descending chromatic bass melody which led critics to refer to the group's sound as Baroque pop, "Bach-Rock" or Baroque n Roll. The session was produced by Brown's father, jazz and classical violinist Harry Lookofsky, who also led the string players. The song is one of a number Brown wrote about Renée Fladen-Kamm, then-girlfriend of The Left Banke's bassist Tom Finn and object of Brown's affection. She was associated with the band for a few weeks, and described as a free-spirited and tall blonde. The song was written one month after Brown met her. 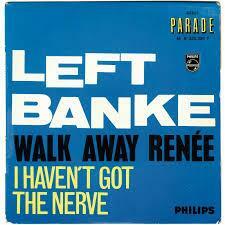 "Walk Away Renee" was one of a series of love songs the infatuated Brown wrote after meeting his newfound muse. Other songs written about her include the band's second hit "Pretty Ballerina" and "She May Call You Up Tonight". After decades of obscurity, she was identified in 2001 as a noted singer, vocal teacher and artist on the West Coast. ^ a b History of Jerome Productions; www.jeromeproductions.com. Retrieved 2014-09-23. ^ "California Dreamin', Present at the Creation". NPR. Retrieved 2011-04-29. ^ The RS 500 Greatest Songs of All Time : Rolling Stone. Retrieved on 2013-01-16. ^ Mary Devlin Medieval Music, Magical Minds 2001 Page 21 "Renée Fladen-Kamm, my longtime vocal coach and vocal director of the Sherwood Consort, is a highly trained and skilled light lyric soprano, who has performed not only early music but opera as well—most often Mozart, who was partial to the ..."
^ Studwell, William E.; Lonergan, David (1999). The Classic Rock and Roll Reader: Rock Music from Its Beginnings to the Mid-1970s. Routledge. p. 148. ^ Whitburn, Joel. (2008). Top Pop Singles 1955–2006. Record Research Inc. p. 317. ^ Brown, Tony. ; Warwick, Neil (2004). The Complete Book of the British Charts. Omnibus Press. p. 426. 19. Swank, Richard F. (2014, March 25). Personal interview.